Homalomena aromatica Schott. belongs to the family Araceae is a rhizomatous aromatic perennial herb and found mainly in subtropical humid climates of Central America and Asia. 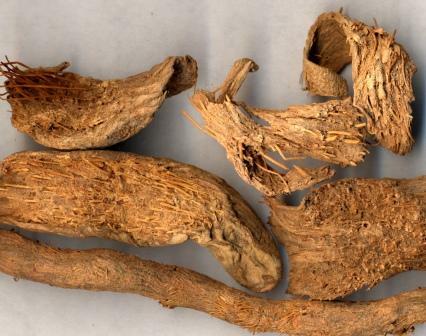 The aromatic rhizomes of Homalomena aromatica contain an essential oil used for blending most of the oriental perfumes. On steam distillation the rhizome yields a yellow coloured essential oil from 2.0 to 2.8% on dry weight basis and the residue is used in incense making. The chemical composition of essential oil reported the presence of 64 components of which 39 components accounting for around 88% of the total oil content where the main components were found to be linalool (32.43%), terpinen-4-ol (14.08%) and sabinene (8.35%). Oil content decreases when the dry rhizomes stored for more than 3 months. Drying under sun without application of heat takes more time and such rhizomes cannot store for longer period and also not preferred in trade but can be used for oil extraction. The medicinal properties of Homalomena aromatica are widely described. In Traditional Chinese medicine, the plant has bitter, pungent and warm properties which are associated with the liver and kidney meridians strengthen tendons and bones and used to treat pain and weakness in lower back and knees along with numbness in the lower extremities. The Chinese named sugandhmantri as qian nian jian which means thousand years of health. Three new sesquiterpene alcohols, 1 beta, 4 beta, 7 alpha- trihydroxyeudesmane, homalomenol A and homalomenol B were isolated from the roots of Homalomena aromatica along with oplopanone, oplodiol and bullatantriol. The chemical profiles of the essential oil suggest the pharmacological activities such as anti-inflammatory, anti-microbial activities, relaxing and calming effects. The essential oil also possess significant antibacterial activity against some of the common clinically significant bacterial pathogens like Staphylococcus aureus, Escherichia coli, Klebsiella pneumoniae, Pseudomonas aeruginosa and Proteus vulgaris with a varying degree of potential inhibitory effect against the tested pathogens. The local people of Manipur applythe fresh root paste against various skin diseases. The ethanol extract of the plant is reported having anti-hepatitis B virus activity. This essential oil showed a good antifungal activity against Curvularia pallecens, Aspergillus niger and Fusarium graminearum as well as showing insecticidal activity against white termite, Odontotermes obesus Rhamb.